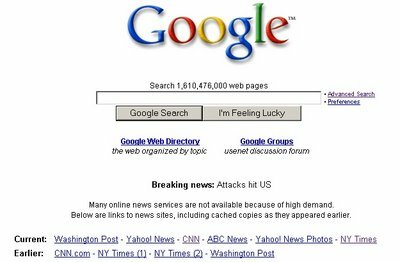 Google News is Google's way to create an online newspaper by automatically selecting the most important news from news sites all over the world and trying to provide an objective view. You can read the homepage, go to a specific section or search for a topic. There was a such a big demand of information after the attack, that many news sites were down or very slow. On 9/11, news-related Google searches were 60 times greater than the number of news-related searches conducted the previous day. In 2001, Nostradamus and CNN were the top gaining queries of the year. Krishna Bharat, Google's principal scientist from that time, realized he could create a tool that clusters related stories, so he could find different perspectives on the same subject. When was Google News released? After he created the news portal, he shared it with his colleagues and most of them liked it. 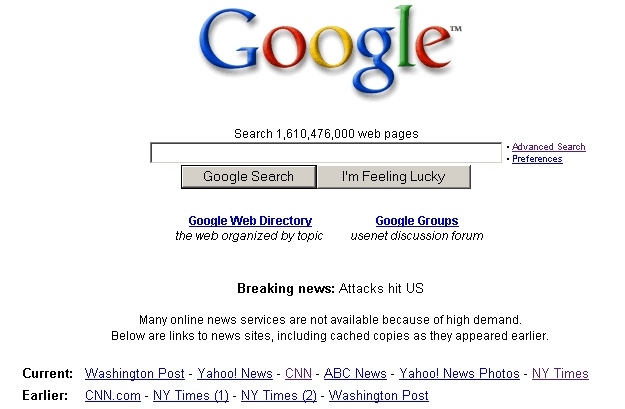 Google lauched the first beta of Google News in the spring of 2002. Why is Google News useful? Krishna Bharat says: "I want this to be a force for a democracy. I want us to be an honest broker, and I want newspapers featured on our site to get traffic from us. [..] One of the things that makes us objective is we show all points of view. Even if you disagree with one, we give you both - the majority and the minority point of view." Does everyone see the same news? At first, the news were the same for everyone. Now Google personalizes the news if you are logged in. You'll see a section of personalized news based on what type of news you usually read. You can share this personalized news with you friends by sending a unique URL found at the bottom of the Google News homepage. How does Google rank the news? Google shows news from more than 4500 manually-reviewed sources. Google News pages are created algorithmically, by showing only the most important news. For each subject, Google tries to remove duplicate stories and show fresh news. Google also takes into account the traffic of the site, the number of editors, breadth of coverage, average story length, number of citations to the story and other factors. Google News Report is a tool that tries to approximate these factors and shows the top scoring stories from the last eight hours, from today, from this month, and this year. There's also a top of the sources: Forbes, Reuters and NY Times are the top 3 sources this month, according to this unofficial hierarchy. Can my site be a source for Google News? It's not very easy to become a source, but Search Engine Roundtable has some tips. You can ask Google to include you site at this page. I've heard about this first time.. Thanks for such information..
Is Consistency Better Than Innovation?